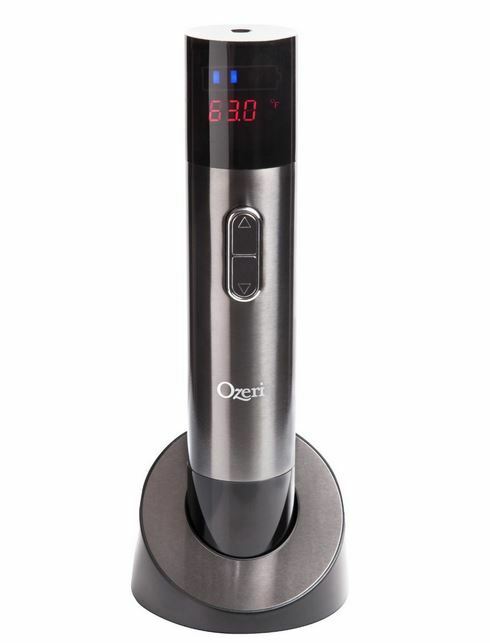 (7) This stainless-steel Ozeri Maestro Electric Wine Opener ($42.95, on sale for $38.28) features an electric wine opener with an infrared wine thermometer and digital LCD screen. This handy gadget also comes with an elegant recharging base and compact foil cutter packaged in a black gift box. (8) This inventive Cuisipro Magnetic Spot Scrubber ($11.99, on sale for $9.99) features a magnetic eraser to help you clean glass without scratching or cracking it; perfect for cleaning those dried-on wine stains. 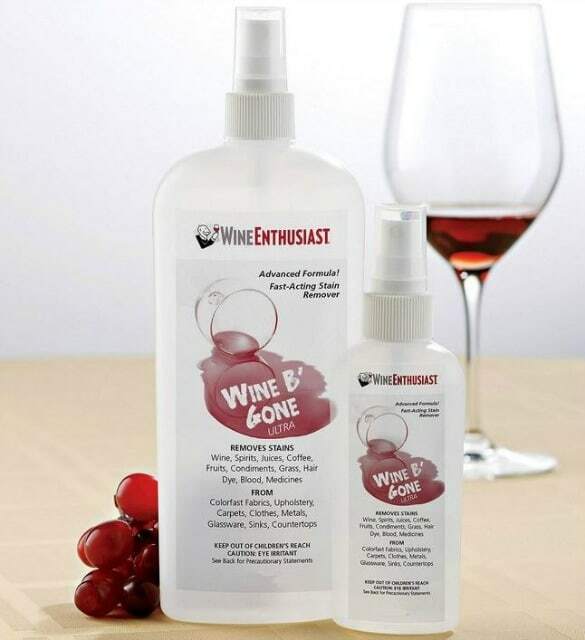 (9) The Wine B’ Gone Stain Remover Set ($29.90) contains ingredients used to remove wine stains from many surfaces and fabrics. According to a review in Good Housekeeping, “it’s a miracle worker on both hard and soft surfaces” and also works well on coffee, tea, and fruit stains. 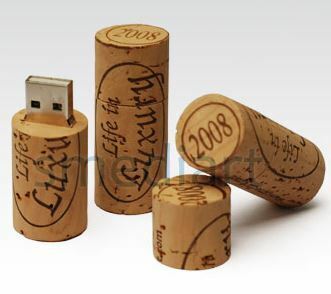 Sounds like a must-have for wine lovers! 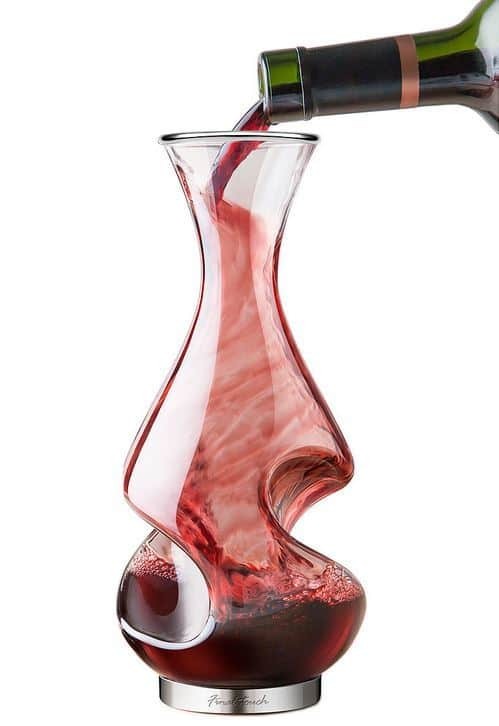 (10) This elegant Twist Wine Decanter ($29.99-$49.99) would be an an eye-catching centerpiece for any tabletop. 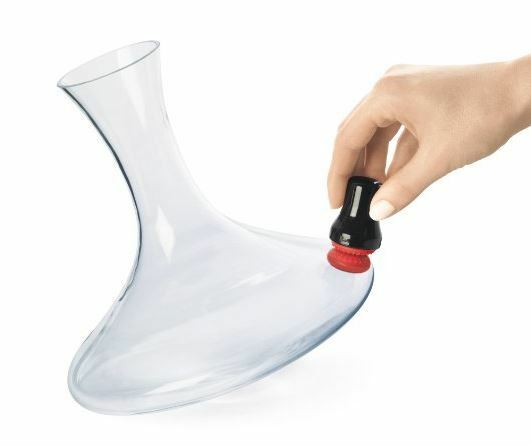 It allows wine to breathe as it travels down the sweeping curves of this gorgeous glass vessel. 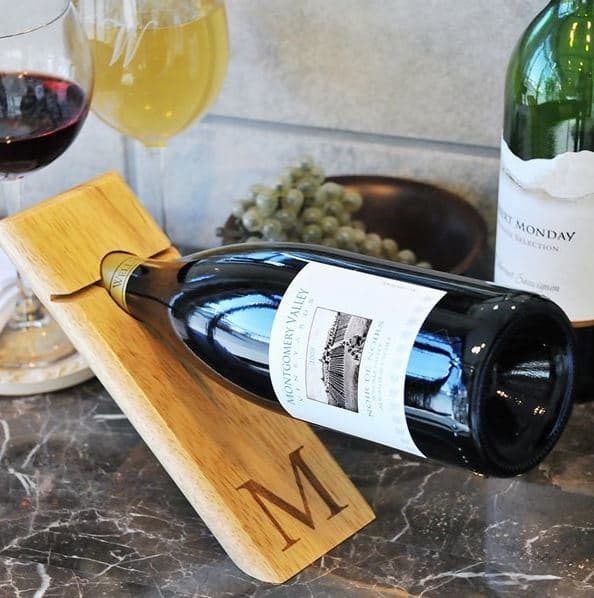 (11) This custom-engraved Counter Balance Wine Bottle Holder ($34) uses nothing more than the science of gravity to give the illusion of a wine bottle being suspending in midair. Very cool! 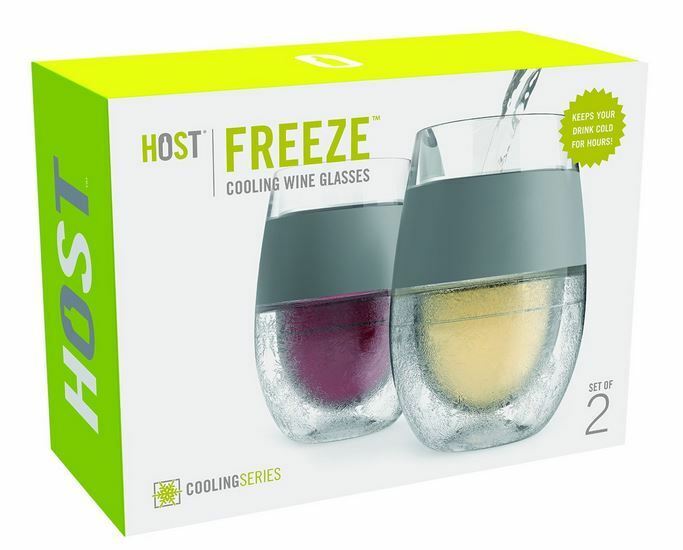 (13) These HOST Freeze Cooling Wine Glasses ($25, on sale for $21.45) allow you to enjoy perfectly chilled wine without the need to chill a bottle of wine beforehand. This gift box includes a set of 2 glasses with built-in cooling gel at the bottom of each cup. 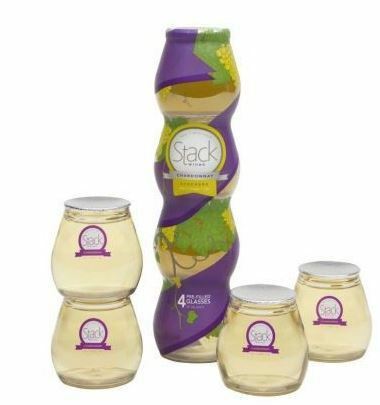 (14) These Stack Wines ($12.99, set of four) are the perfect picnic accessory! You can choose from California Pinot Grigio, Red Blend, California Chardonnay, and California Cabernet. 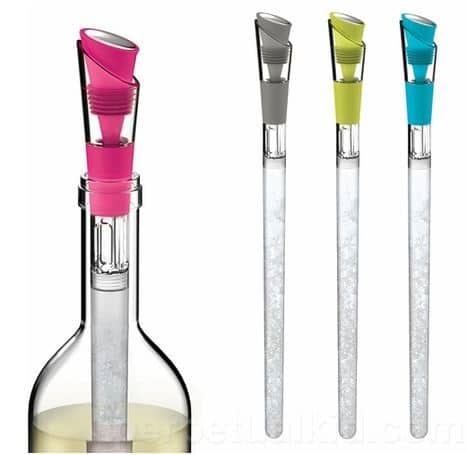 (15) These fun Wine Cooler and Pour Spouts ($33.99 each) allow you to keep wine cool while also providing a pour spout for easy access. 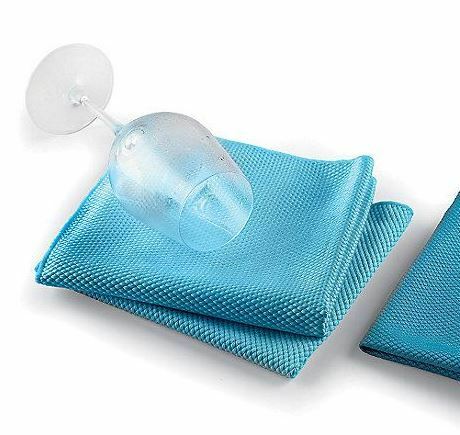 (16) This Microfiber Wine Glass Towel ($14.94, set of four) is made of a textured poly-blend fabric which is created to wipe away water without leaving lint behind. This machine washable towel is available in blue or white colors. 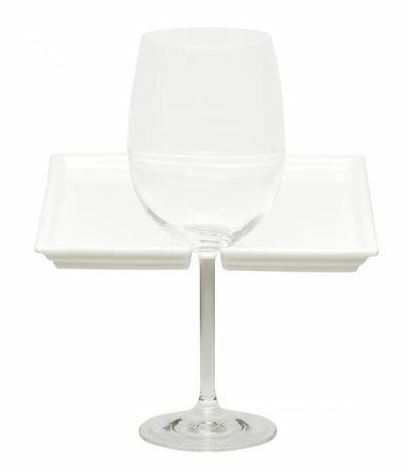 (17) This charming Wine Party Plate ($19.97, set of two) makes it easy to carry a drink and appetizers in one hand. These stylish plates are made of porcelain and are dishwasher/microwave safe.